Looking for a great getaway or just some information about your next trip to the Big Bend? Click the image above and link to Big Bend Shellfish Trail information! CB’s Saltwater Outfitters, 1249 Stickney Point Rd, Sarasota, FL have announced dates for their Orvis-Endorsed fly fishing schools for the winter and spring; Jan 20, Feb. 24, Mar. 24, and Apr 14, 2018. Located on Siesta Key, named Best Beach in America, the schools will cover fly casting basics, line control, shooting line and the roll cast. Instructors, Capt. Rick Grassett and Capt. Ed Hurst, will also cover leader construction, fly selection and saltwater fly fishing techniques. The course, designed for beginning and intermediate fly casters, will focus on basics but also work with intermediate casters on correcting faults and improving casting skills. Cost for the schools, which will run from 8:30 AM to 2 PM, is $175 per person and includes the use of Orvis fly tackle and lunch. Contact CB’s Saltwater Outfitters at (941) 349-4400 or info@cbsoutfitters.com to make reservations. Anglers fishing with me, out of CB’s Saltwater Outfitters on Siesta Key, caught and released false albacore (little tunny) and tripletail in the coastal gulf on flies during the past week. Conditions and water temperature have been ideal, most of the time, for migratory species in the coastal gulf and action has been great! Lynn Skipper, from Apollo Beach, fished with me on Tuesday. We had wind and clouds that day so conditions were tough in the gulf. However, despite poor visibility we found several tripletail and Lynn caught and released his first tripletail on a fly. Great job! Jim Collins, from Bradenton, and Peter Ryan, from CO, fished the coastal gulf with me on Wednesday. Conditions were great and fish responded accordingly. They had non-stop action catching and releasing albies to more than 10-lbs and Peter also caught and released a tripletail on a shrimp fly pattern! The action continued on Saturday when Mike Perez, from Sarasota, fished the coastal gulf with me. He also had great action catching and releasing numerous albies and a couple of tripletail on a variety of glass minnow fly patterns. Rod bending, drag screaming action, love this time of year! With the water temperature in the low 70’s, action with Spanish mackerel, albies, tripletail and cobia in the coastal gulf should continue. 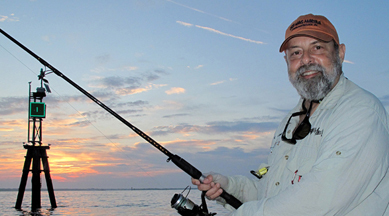 There should also be good action with trout and more on deep grass flats of Sarasota Bay. Shallow water action for snook, trout and reds is improving due to cooler water. Fishing lighted docks and bridges in the ICW for snook with flies and DOA Lures should also be a good option. Fishing this month will be weather dependent, but will almost certainly be excellent. The water is clear and we’ll see how the temps respond to a cold snap, but the flats will still be producing a lot of fish. Slow down your presentation with chillier temperatures. Jigs and Gulp baits will do well. Look for schools of large redfish this month. And one of our more seasonal species, silver trout (called sand trout by some) have arrived in force. Personally I think they fight harder than spotted seatrout and they are better eating. And there are no limits on catches. They are usually caught in deeper water from 4 to 8 feet, and frequently over sand with less grass than on the flats. They are caught with spotted trout, usually smaller fish. Target them with the same techniques as spotted trout…jigs with soft tails or Gulp baits do well. Hot spots included areas west and northwest of the Birdrack and inside of Little Bank in 5 to 7 feet of water. Look for humps on your depth finder, and re-drift over areas of fish when you find them. We’ll be waiting for real cold weather to see if it drives trout into the river but that will be more likely in the next few months. NOAA’s Office of Coast Survey will launch the newly redesigned website, nauticalcharts.noaa.gov, on November 14, 2017. The website will feature simplified navigation and a responsive layout for all platforms, making your favorite NOAA charting products easy and convenient to find. We encourage everyone to visit and explore the site on or after November 14. Because of this redesign effort, many of the webpages within nauticalcharts.noaa.gov will have a new address. Please be prepared to update any bookmarks or links you may have. Some of the hardest hitting and drag pulling fish that pass through the Nature Coast heading south are biting now. Spanish mackerel are abundant on the near shore rocks and coastal flats. The flats mackerel are mixed in with trout over hard bottom in 3 to 5 feet of water. Just like the trout they will hit most jigs but the bad luck about mackerel are they’re sharp teeth. Luck has allot to do with landing spanish mackerel while trout fishing and one way to have more luck is to set the hook quickly with every strike. This will help prevent the bait from getting to close to those sharp teeth. Sometimes an angler will get cut off but it happens. On the near shore rocks a chum bag will help concentrate the fish. Use live shrimp on a 2/0 long shank Eagle Claw hook free lined with the tide and chum for the best bite. The long shank hook acts like a leader without having to use wire that mackerel will sometimes shy away from. On the bottom around the near shore rocks there are grunts and a few sheepshead biting also. The waters are starting to clear up some. We have experienced some coffee colored water from the north west wind pushing the tannin stained fresh waters from the Waccasassa and Withlacochee River toward the south. Look for incoming tide this weekend to be in the morning. Anglers fishing with me, out of CB’s Saltwater Outfitters on Siesta Key, had good action catching and releasing trout and bluefish in Sarasota Bay and tripletail, Spanish mackerel and false albacore (little tunny) in the coastal gulf on flies, CAL jigs with shad tails, jerk worms and DOA Shrimp during the past week. As anticipated, with the water temperature down to the mid 70’s, action turned on in the coastal gulf. Fly anglers Jim Collins, from Bradenton, FL and Dave Graham, from Evergreen, CO, fished with me on Tuesday and Thursday. We worked deep grass flats on the east side of Sarasota Bay on Tuesday and they had steady action catching and releasing numerous trout and several nice bluefish on Ultra Hair Clouser flies. We fished the coastal gulf on Thursday and it was on fire! They had great action catching and releasing Spanish mackerel and 7 or 8 albies on my Grassett Snook Minnow fly. Although you usually have to work hard for them, the fish stayed up all day long, blitzing glass minnow schools and giving us steady action. Jim’s last fish of the day was a 12-pounder that took him deep into his backing, around a crab trap float and around the boat several times! Massimo Giardina and Tatiana Migliaretti, from Switzerland, fished Sarasota Bay with me on Wednesday morning. They had good action catching and releasing trout on CAL jigs with shad tails and 4” jerk worms and Ultra Hair Clouser flies in the morning. We fished the coastal gulf in the afternoon and they had good action catching and releasing numerous Spanish mackerel and a couple of nice albies on CAL jigs with shad tails and Ultra Hair Clouser flies. They finished the day with a 5-lb tripletail on a 2.75” DOA Shrimp! This should be just the start of good action with Spanish mackerel, albies, tripletail and cobia in the coastal gulf. There should also be good action with trout and more on deep grass flats of Sarasota Bay. Shallow water action for snook, trout and reds is improving due to cooler water. Fishing lighted docks and bridges in the ICW for snook with flies and DOA Lures should also be a good option.